The new entrance to Leeds Station, the one that looks a bit like Kylo Ren from Star Wars if you look at it from a certain angle, has suddenly connected the waterfront area around Granary Wharf a little more successfully with the city. The trail down under the underpass and past the roar of the Dark Arches has gone if you’re heading city-bound by train, and you end up right in the heart of the Wharf. That area was something of an alternative haven way, way back, packed with stalls selling crystals and Native American paraphernalia that had an uncertain use in West Yorkshire, but that part has disappeared, and the focus is on the waterfront, with new bars and restaurants emerging all the time, cocooned in the old railway arches, facing the canal. It’s been renovated and developed well, and investment has attracted a string of new venues, Bilbao Bar among them. 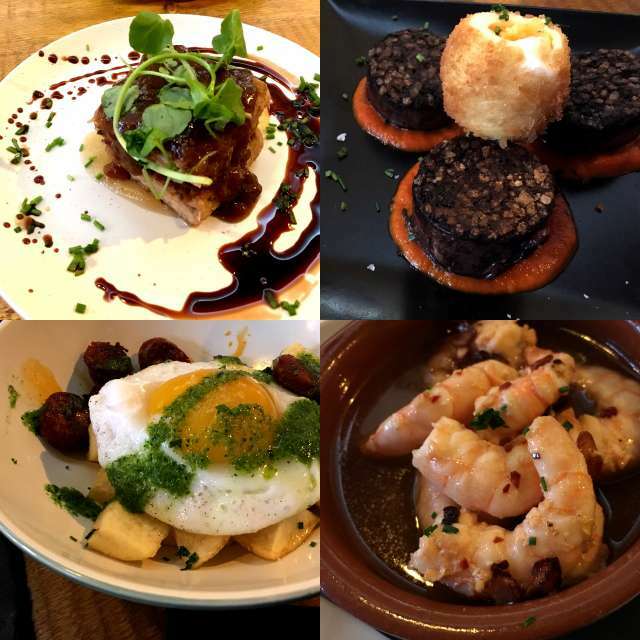 Open for a couple of years now, Bilbao Bar is the closest thing to a Basque style pintxo bar in West Yorkshire. It’s like stepping into somewhere in the back streets of San Sebastian. There’s a big, broad counter, designed to be loaded up with food, and intended for use by people casually propping it up, glass of Rioja in one hand, slice of octopus on toast or whatever in the other. It’s an excellent space. The drinks list is extensive, with pushing thirty variations on a gin and tonic, a similar number of wines of largely Spanish vintage, and a small but quite effective selection of beers that pitches the likes of Estrella Damm up against Saltaire and Ilkley Brewery’s finest, and Meantime’s superb Yakima Red. We went through the normal, routine ‘how many plates shall we get, what if that’s not enough, let’s get another just to be sure, we’ve ordered calamari, haven’t we?’ conversation that everybody who walks through the door of any tapas restaurant in Britain has, and ended up with seven dishes (three each plus one for good luck). The standard was universally good. No duff plates whatsoever. The standout for me, which I got to eat in its entirety because it consisted of black pudding, which is revolting, I’m told, was a plate of morcilla, a Spanish version of Bury’s finest that uses rice as its starchy element. Three thick slices served with a soft-boiled egg, coated in breadcrumbs and deep-fried to a crisp, which was lovely. We had some of the usual tapas suspects, too, including some simple fried potatoes strewn with slices of chorizo and a fried egg, and a pile of crisp and crunchy calamari, squid sliced into wide, generous chunks and cooked very well indeed. There were a few specials on, including a dish of pork ribs, which consisted of the meat from a rack of ribs cooked long and slow stripped off the bone and formed into a pair of little cubes, then fried off in a hot pan. Taking a fork to one of these cakes of meat caused it to tumble apart and open out like a concertina, beautiful, tender pork meat unravelling on the plate. I had high expectations of Bilbao Bar, mainly because I’d heard that most of the kitchen crew come from the Basque region of Spain, and a couple of weeks over there a few years ago left me in little doubt that those people really know how to cook, and it lived up to expectations. One of the deciding factors was the service – the waitress who looked after us was absolutely brilliant. She embodied that Spanish warmth and hospitality that’s so important to a place like this. I missed Granary Wharf when it went through its decades-long bout of aimless wandering, but the whole place is back, and bars like Bilbao are a real asset. Seven tapas, a couple of drinks and a couple of desserts (almond cake! oh, my) were about £65, so not super-cheap, but not over the top. Worth it for the standard, and worth it for the welcome.